Donovan Mitchell did not win Rookie Of The Year, and that’s fine. He’s evolved into a really nice high volume scorer, that doesn’t really create for others or rebound at a meaningful rate. But sometimes, because he shoots so much, he can take over a game. Donovan Mitchell is really the prototypic 6th man, and the Jazz are lucky to have him on a rookie salary. So we made this shirt to honor Mitchell, with an award that maybe, just maybe, he’ll be able to win if he stays in the league long enough. He’s definitely in the top five of NBA 6th man now! It’s a high quality silk screened super soft triblend shirt and it’s just $19.99! 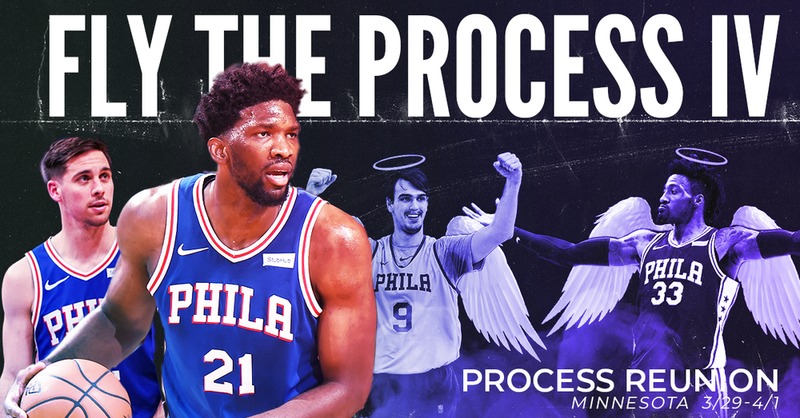 Fly The Process IV to Minnesota has less than 40 spots left! Let’s go see Roco and Dario. The trip will be March 29th until April 1st, is actually cheaper than the Atlanta trip, and will allow us to see and cheer for our old friends Roco and Dario, and maybe try to reunite the Core Four of the Process. All of the details are right here.